With the mysterious disappearance of vampires, rumors abound that a species war is brewing. A zealot is inciting tensions between the vampires and ghouls, and if these two powerful groups clash, innocent mortals could become collateral damage. 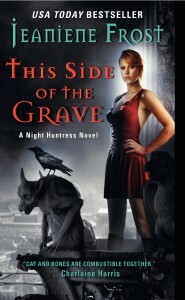 Now Cat and Bones are forced to seek help from a dangerous “ally”—the ghoul queen of New Orleans herself. But the price of her assistance may prove more treacherous than even the threat of a supernatural war. …to say nothing of the repercussions Cat never imagined. For downloadable wallpaper of the cover and stepback, go here. Audio book is available! Go here for details. – #1 New York Times bestselling author Charlaine Harris. – Romantic Times, Top pick! Want to get reminded about new releases, special sales and personal appearances in your city? Then sign up for Jeaniene's newsletter.